In general, all teachings in India are free and open to the public. For teachings in Dharamsala, you will need to register in person at the Tibetan Branch Security Office in McLeod Ganj (near Hotel Tibet), preferably three to four days before the teachings begin. For registration, you will need to bring 2 passport size photos along with your passport. There is no advance registration service. People attending the teachings are responsible for their own board and lodging. Seating is usually reserved on a first come - first serve basis. In the West, seating for public events is in most cases designated by your ticket and seat number. In India, seating for teachings is usually on the ground. The conventional practice amongst Tibetans is that you take your seat on the first day of a series of teachings, mark it with your cushion or piece of cloth, and thereafter, keep to that same seat for the duration of the teachings. This is how Tibetans have traditionally avoided hassling with each other over who sits where every day. So, following the old adage “When in Rome, do as the Romans do”, it seems reasonable to suggest that when among Tibetans, do as the Tibetans do. Usually, people come to the teaching venue 1 or 2 days before the teaching begins to reserve their seating space. For people requiring translation services, there is a designated area at the teaching venue. His Holiness teaches in Tibetan. Therefore, on most occasions when His Holiness is teaching in India an effort is made to provide simultaneous translation into English. If you wish to listen to the translation, you are advised to bring a FM radio. Headphones are a must since you do not want to disturb the majority of listeners nearby, who may not be listening to the translation. Although the quality of the signal varies according to the local conditions, you can often improve reception by changing the angle and position of the antenna of your radio, which is often incorporated in the headphone lead. What will the weather in Dharamsala around the year? The best seasons are the beginning of March through to the end of June and mid September through to the end of November. The temperature is around 20-24c. The summer/monsoon season which brings fog and mist, an umbrella and non-slippery or waterproof type shoes are recommended. Winters are quite cold, temperature around 7-14 c nights severly cold when temperature dips to 0 c.
What suitable clothing should I bring? During the teachings - No sleeveless tops or spaghetti straps. Electricity used in India is 220 volts AC. They use a 2 pin plug. What important things do I to bring on this trip? His Holiness will be teaching in Tibetan so a portable FM radio with earphone is necessary to receive the translations. Torch light because power failure is common. What are the things that I cannot bring into teachings? What are the things I should bring to the teachings? Note: Below is the public schedule of His Holiness the Dalai Lama both in India as well as abroad. Please note that for many of these events, tickets are required in order to gain entrance. People are requested to contact the organizers directly or visit the websites given below for further information on tickets. In general, most of the events in India are free where as the majority of events abroad require paid tickets. 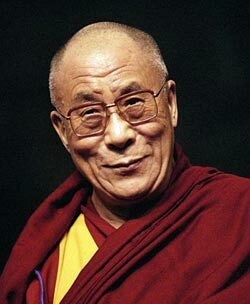 For your information, as a long-standing policy His Holiness the Dalai Lama does not accept any fees for his talks. Where tickets need to be purchased, organizers are requested by our office to charge the minimum entrance fee in order to cover their costs only. Please note that the below dates are subject to change. Teaching in Dharamsala, HP, India from August 25 to 27: His Holiness will give a two and a half-day teaching on The Sutra of the Explanation of the Profound Secrets - Sandhinirmocana Sutra (dode gongdrel) at the request of a group of Koreans at the Main Tibetan Temple. Teaching in Dharamsala, HP, India from December 2 to 4: His Holiness will give a two and a half-day teaching on Tsongkhapa's Three Principal Paths (lamtso namsum) & Tsongkhapa's Foundation of All Good Qualities (yonten shekyurma) at the request of a group of Mongolians led by Lamiin Gegeen at the Main Tibetan Temple. Kalachakra in Leh, Ladakh, J&K, India from July 3 to 14: During the first three days of the Kalachakra, from July 3 to 5, His Holiness the Dalai Lama, along with the monks of Namgyal Monastery and senior lamas, will conduct rituals which prepare and consecrate the venue. These include chanting of prayers, creation of the sand mandala and other rituals. From July 6 to 8, His Holiness will give preliminary teachings. On July 9, the Kalachakra Ritual Dance will be performed by the monks of Namgyal Monastery. His Holiness will confer the Kalachakra Initiation from July 10 to 13. On July 14, a long life empowerment (tsewang) and a ceremony offering prayers for the long life of His Holiness the Dalai Lama will be performed. Teachings in Bodh Gaya, Bihar, India from January 5 to 9, 2010: His Holiness will give five-day teachings on Nagarjuna's In Praise of the Transcendental (jigten ley depar toepa), Atisha's Lamp of the Path to Enlightenment (jangchup lamdron), Longchen Rinpoche's Mind In Comfort and Ease (semnyid nyelso) & Tsongkhapa's Short Version of the Stages of the Path To Enlightenment (lamrim dhuedhon) from January 5 to 8. On the morning of January 9 His Holiness will confer a Long Life Empowerment (tsewang) and a long life offering will be offered to His Holiness. Teachings in Ladakh, J&K, India in July: His Holiness will give teachings in Kargil and in Nubra during the second half of July (topics yet to be decided). According to the tentative dates, he will be giving teaching in Bodhkharbu (Kargil) on July 20 and in Sumur & Disket (Nubra Valley) on July 22, 23, 26 & 27. There is no visit to Leh or Zanskar planned in 2010. Teaching in Jispa, HP, India from August 18 to 20: His Holiness will give teachings on Atisha’s Lamp for the Path to Enlightenment (jangchup lamdron) on August 18. On August 19 he will confer the Heruka (dechok) Initiation. On August 20 he will confer the Avalokiteshvera (chenresig) Initiation. Teaching in Dharamsala, HP, India from August 28 to 30: His Holiness will give three-day teachings on The Diamond Sutra (dorjee chotpa) at the request of a group of Koreans. Teaching in Dharamsala, HP, India from September 8 to 10: His Holiness will give three-day teachings (topic yet to be decided) at the request of a group of Southeast Asians. Teaching in Dharamsala, HP, India from October 4 to 7: His Holiness will give four-day teachings (topic yet to be decided) at the request of a group of Taiwanese. Teaching in New York, NY, USA on October 4: His Holiness will give a half-day afternoon teaching on Nagarjuna’s Commentary on Bodhicitta(jangchup semdrel) organized by a Vietnamese group at the Manhattan Center. Spring Teachings Earlier Scheduled from March 12 to to 21 in Dharamsala have been canceled this year. Teaching in Mundgod, Karnataka, India from January 3 to 14: His Holiness will give teachings on Jamphel Tsencho and Lhamo Jenang on Janaury 3 to 5 at Drepung Lachi Monastery. On January 7 His Holiness will inaugurate the new Drepung Loesling Assembly Hall. From Janaury 8 to 13 His Holiness will give extensive teachings on Panchen Sonam Dakpa's Pharchin Chidon Yumdon Selwa Donmey, Jetsun Champa Gonpo's Ngontok Gyen & Lopon Senge Sangpo's Drelwa Donsel at Drepung Loseling Monastery. He will also confer the Dorjee Jigche Lha Chusoom Initiation. On the morning of January 14 His Holiness will confer a long life empowerment and a long life ceremony offering for His Holiness will be held. Teaching in Dharamsala (H.P. ), India on February 20: His Holiness will give a teaching from the Jataka Tales. Teaching in Dharamsala (H.P. ), India from February 21 to March 1: His Holiness will give his annual spring teachings on Lord Buddha's 34 Jataka Tales (khay-rab so-shi) and Dhammapada (tsom). Teaching in Dharamsala (H.P. ), India from September 30 to October 4: His Holiness will give five-day teachings on Arya Nagarjuna's Commentary on Bodhicitta (jangchup semdrel) and Kamalashila's The Middling Stages of Meditation (gomrim barpa). The teachings are primarily for Chinese Buddhists mainly from Taiwan. Public Talk in Melk, Austria on September 19: His Holiness will give a talk as part of the Waldzell Dialogue at the Melk Abbey Church. Public Talk in Wiesbaden, Germany on September 22: His Holiness will give a talk in the afternoon at Hessenpark in Wiesbaden. Teaching in Dharamsala from October 1 to 5: His Holiness will give five-day teachings on Nagarjuna's Commentary on Boddhicitta (jangchup semdrel) at the request of a group of Koreans.